One of the biggest debates nowadays in the internet world is the issue of which is better to use, a full text RSS feed or a partial feed. Many points have been brought up and many voices have been heard. But let’s get back to the definitions and features of each. Full text RSS Feeds is a kind of feed in which the subscriber can see the entire post in the feed reader. Many says this is way, way better than using the partial feeds for they say it generates more long lasting traffic. It is also said that using post excerpts of partial feeds only forces the reader to visit the website just to get the whole story. Well, taking both sides and understanding them correctly, both may be best depending on what type of business you are running. If the business that a certain person has is dedicated to information, sales, self-help and such fields which require a full- packed and detailed information, well Full RSS Feeds may be beneficial for you. Reaching out to readers through comforting words can build empathy and sympathy to whatever reasons they have for searching for articles like what you have. Which means, if the website that contains the article they initially read have the same topics in the entire website, well, a very long-lasting and honest relationship between the website and the readers will be established. Using Full Text RSS Feeds on your traffic will eventually turn to loyalty and honesty. If the business is about major news and sports and if you are running a website related to a fast pace kind of information, well, partial RSS feed is suitable. These kind of businesses have the same business model they’ve always had. Which means, the more people reading their articles, doesn’t matter whether it’s print or online, the more they can gather money from advertising. Their number one goal is to get a lot of people back to their sites so they can maintain high numbers and high advertising rates. Doesn’t matter whether your business’s goal is for information dissemination or solely about generating advertisements, it is always important to weigh first both sides of the story, know the reasons behind everything and think critically before reacting to something. Every strategy is formulated to cater for a certain audience, in this case a certain field. Not all styles are applicable to everyone. 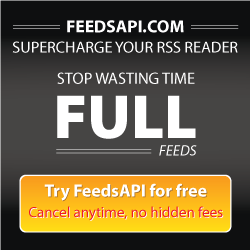 So full text RSS feed caters to a certain audience or business, so as the partial RSS feed.